Love this snowman! He is made from aged flannel, with a red cap and scarf. 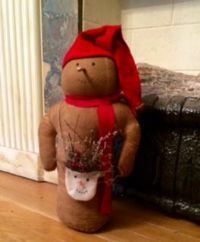 He has a sweet snowman bag filled with twigs, red berries and moss. About 18"